Why a new Tails Greeter? 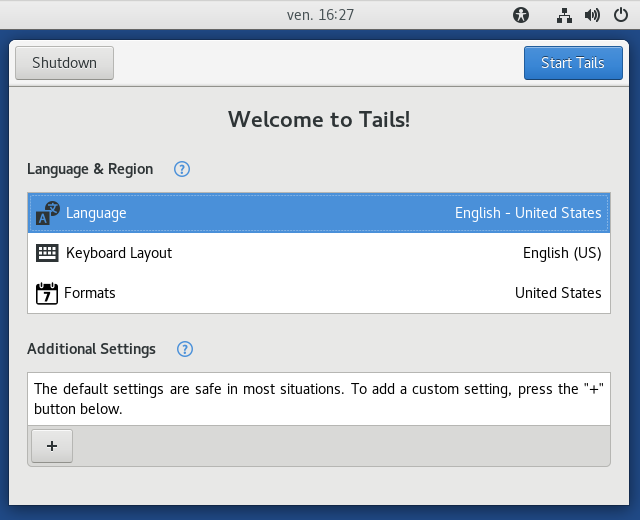 What is new in the redesigned Tails Greeter? How to test the redesigned Tails Greeter? Tails Greeter is the set of dialogs that appear after the boot menu, but before the GNOME Desktop appears. It lets you choose your language, enable your persistent volume, and set a number of other options. Usability testing has demonstrated that it is not as easy to use as we would like, especially for people trying Tails for the first time. We have pushed the old interface to its limits; it cannot accommodate the options we would like to add to it. Keep in mind that this is a test image. We did not carefully test it so it is not guaranteed to provide any security or anonymity. The line corresponding to the ISO image is the one whose size is 1G. You cannot install this ISO image from Tails 2.x. It is impossible as well to upgrade to this ISO image from Tails 2.x. So, either install or upgrade from a non-Tails system, or start this ISO image from DVD and then clone it to a USB stick. To install this ISO image, follow our usual installation instructions, skipping the Download and verify step. Don't hesitate to test all kinds of options, and ensure they are taken into account in the Tails session. If you find anything that is not working as it should, please report to us on tails-testers@boum.org, including the exact filename of the ISO image you have tested. This experimental ISO image is based on Tails 3.0~alpha1, so all open issues for Tails 3.0 apply to it as well. Tails Greeter is not translated in many languages yet. We have a donation campaign going on: we explained you why we needed donations, how we use these donations, and we shared with you our plans for the next years. So if you want Tails to remain independent, if you want to enable the Tails team to work on projects we think are important, such as redesigning Tails Greeter, please take one minute to make a donation.